Exploring the outdoors has been a part of Lenée’s life from a very early age. Growing up in East Texas, Lenée spent most of her childhood days exploring the deep piney woods and fishing lakes, creeks, and ponds with a spinning rod, a cane pole, or just a stick with some string and a hook! Lenée has been a part of AWG family from the very beginning when Alvin Dedeaux, our head guide, first had the idea to start a guide service. She first started fly fishing when she met Alvin 10 years ago. 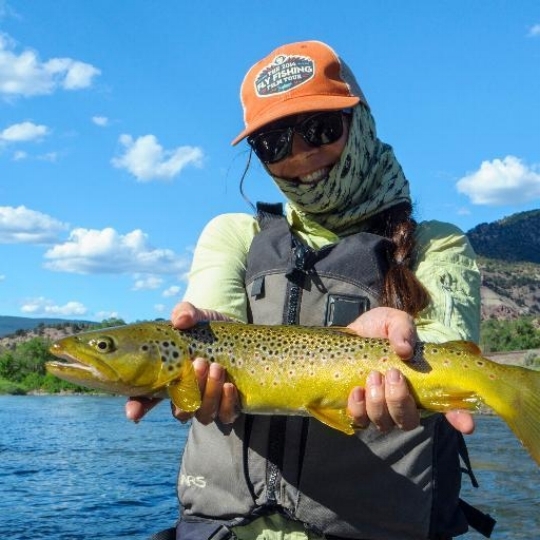 Since then Alvin, and the other amazing guides in the AWG family, have shared with Lenée their expert knowledge in everything you need to know about fly fishing and, most importantly, how to be a great guide. And she has spent countless days exploring and fishing on our local rivers and the Texas coast with Alvin scouting for the best locations to catch fish. Lenée graduated from Texas State University with a Master’s degree in Aquatic Resources in May 2017 where she studied natural resource management and hydrologic data mining. She also has a Bachelor’s degree in Geography from Texas State University where she studied river basin management and Texas water policy. She is deeply passionate about protecting our natural resources and local water ways and strives to pass this passion on to her and Alvin’s three daughters. Lenée is very grateful and proud to be able to represent women anglers for the AWG family and hopes to bring the joy of fly fishing to as many people as she can.